Because of its far greater range and acuity compared to ultrasonic detection devices, radar is proving itself to be the most useful tool in assessing bat movement and activity. Bat Surveys Ireland is excited about these possibilities and we recently attended the DeTect MERLIN Radar System User Training Class for Wind Energy Applications in London and have had follow up meeting with DeTect staff in Ireland where we visited a number of proposed wind farm sites and discussed the application of this technology. We are working closely with DeTect and clients, such as Galetech Energy, to introduce DeTect MERLIN radar system for wind farm pre-construction surveys and for operational wind farms to Ireland. 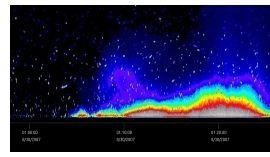 DeTect developed the VESPER Fixed-Beam Vertical Profile Radar to provide species differentiation and identification or birds and bats based on measurement of wing beat frequency of bird, bat and insect targets as they pass through the beam. Further details on the systems can be found on this link http://www.detect-inc.com/wind.html#VESPER. If you need a bat survey please contact us +353 (0)61 419477. Our main website is www.ecofact.ie. We provide a range of bat survey, monitoring and mitigation services, including supply and installation of a range of bat boxes. We are Ireland’s leading provider of bat surveys and specialise in assessments for wind farm sites.